Flavor Text: He loved the satisfaction of a job well done. A grown man who can make even David Pan cry. 2 Steadfast means if Agency is your minor faction, he may not be able to play right away. What this guy needs is a Springfield M1903. Danigral - 3 out of 5. Although he won’t fit into many decks, he’s an okay blocker vs. rush decks that try to get a couple of early tokens with icon-less or icon-lite characters, and only if they commit 1 perhaps. Paired with Syndicate he also has very annoying synergy with David Pan. He may also be good in a mono-Agency control deck, whatever that may look like coming from this box. Other than that, he won’t really go in an aggressive rush or aggro Agency build because you’d rather have characters that can get you tokens instead of trying to prevent your opponent getting some. mnBroncos - 3 out of 5. Obviously this guy can be a 5 against some Syndicate decks,however, besides that he is just a solid character mainly because he cost 0. He does have two steadfast though so if you're splashing Agency probably won’t get this guy out turn 1. He will see a good amount of play because 0 cost is great on a body but most of the time his ability isn’t that relevant. Obtuse - 2 out of 5. He’s definitely the right price at 0, and I don’t hate his ability. I’d rate him a little higher if he wasn’t steadfast two. 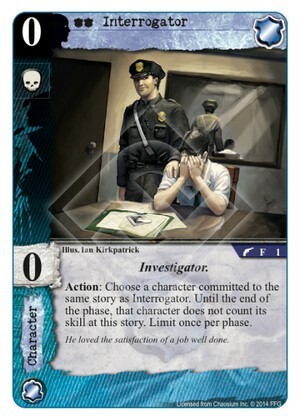 I can see him playing a little good cop/bad cop with Mr. David Pan in an Agency/Syndicate deck. Kamacausey - 2 out of 5. I'm not the biggest fan of characters with zero skill. He has a decent ability but him not having any skill really hurts his effectiveness. Two steadfast doesn't help his case either. He's almost a 1 for me but his ability is what saves him from being complete toilet paper. livingend - 2 out of 5. Everything that bypasses the action limit domains impose on us, and therefore lets you immediately convert card advantage into board advantage, is at least worth consideration. I’m wary of 0 skill characters though because the ability to claim 2 success tokens on its own is usually the most important contribution of an early game chud before it becomes obsolete in the grand scheme of things. Verdict: Run it only if skill matters for you (Syndicate shenanigans, Parallel Universe et cetera) or if your deck is steeped in card draw (Agency, MU, Yog trifaction deck anyone?). WWDrakey & Ire - 4 out of 5. Never underestimate the effect of having the perfect cost. Also, being able to stop an Ancient One from bulldozing successes in alone, means that this little guy is far from being a slouch. Agency is a Faction that loves to keep it's 1 resource domains open, and this curious fella helps with that greatly, while still not opening you up too much to a Black Dog. This guy has often been useful in my Government deck in case I don't have a perfect start. This guy can slow things down for the opponent just enough to get board advantage back and counters Syndicate skill shananigans and Ancient Ones very nicely. What does it mean to "not count skill?" Does that only affect the skill check, or can it also affect the icon struggles when combined with St. Claire and Mr. David Pan? St. Claire references character skill, but not the counting of character skill, so you couldn't use Interrogator to keep a characters icons from being used via. St. Claire. St. Claire doesn't reference printed skill so other skill lowering effects could be used though. For Mr. David Pan, his card does refer to counting skill, so Interrogator's effect used on a character would prevent their skill from being used in the calculations for icon checks at the same planet as Mr. David Pan. I'm a little surprised by some of the reviews on this card. True, Interrogator doesn't fill the classic role of a rush character because he's not able to grab 2 success tokens on his own. However, he IS helpful in grabbing you an unopposed success token when combined with someone like King John. Even if your opponent brings two blockers, the Interrogator helps to kill one of them and negates the skill of the other one. I actually do see the Interrogator having a role in a rush deck as long as you still have enough other turn 1 characters (probably another 12+) to pair with him. I haven't used him much, but when I have played against him he has been very annoying. He has a strong defensive or anti-rush effect. He can stop most characters that cost 2 or less from succeeding at a story by themselves. This can easily slow a faster deck enough to get you in the game. And with powerhouses like The Foundation, agency has a much better slow game than it used to.